Falkirk and Rangers have five players each in PFA Scotland teams of the year for their respective divisions. It means that the third-top Bairns have five times as many players chosen by their fellow professionals than Scottish Championship leaders Dundee. Promotion rivals Hamilton Academical have three representatives, as do Dunfermline Athletic, who are second in League One behind champions Rangers. League Two champions Peterhead have four in their division's XI. 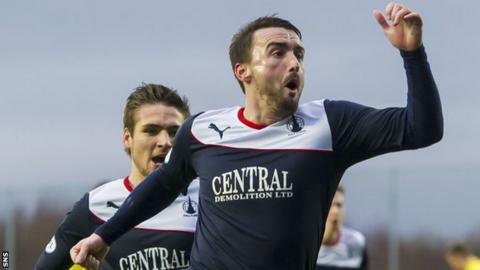 PFA Scotland had already named Falkirk's Rory Loy along with fellow strikers Peter MacDonald, of Dundee, and Kane Hemmings, of Cowdenbeath, along with Accies midfielder Anthony Andreu, as the Championship player of the year nominees. Loy is joined by goalkeeper Michael McGovern, defenders Will Vaulks and Stephen Kingsley, plus midfielder Mark Millar, in the team of the year. Rangers trio Jon Daly, Nicky Law and Lee Wallace were among the player of the year nominees in League One, along with Ayr United's Michael Moffat, and are joined in the team of the season by goalkeeper Cammy Bell and captain Lee McCulloch. Peterhead duo Rory McAllister and Andy Rodgers were on the League Two shortlist along with Berwick Rangers midfielder Lee Currie and Annan Athletic forward Kenny MacKay. Blue Toon team-mates Graeme Smith and Steven Noble are also in the League Two team of the year.